We specialize in multiple sealant applications including weather proofing decks, epoxy flooring, concrete overlays, stained & polished concrete, interior & exterior painting. 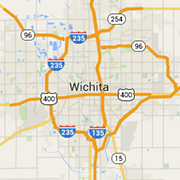 We are a full-service bail bonds company serving the Wichita and surrounding areas. Locally owned and operated over 20 years. Specializing in all types of construction & remodeling including windows, siding, painting, and roof replacement. Wichita’s reliable handyman service for over ten years. Our work is 100% Guaranteed.